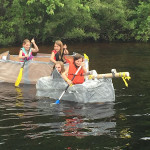 Sand Lake Elementary 5th grade students in Mrs. Karhoff, Mrs. Parkhoff and Mrs. Scott’s class celebrated the last days of school by completing an engineering challenge. 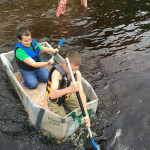 Students were asked to work in teams to design a boat made from cardboard, duct tape and plastic, which could support two people. 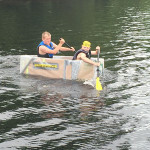 Boats were put to the test on Sand Lake at a year-end picnic last week. The design teams “Money Machine” and “Sharknado” came in first and second place.